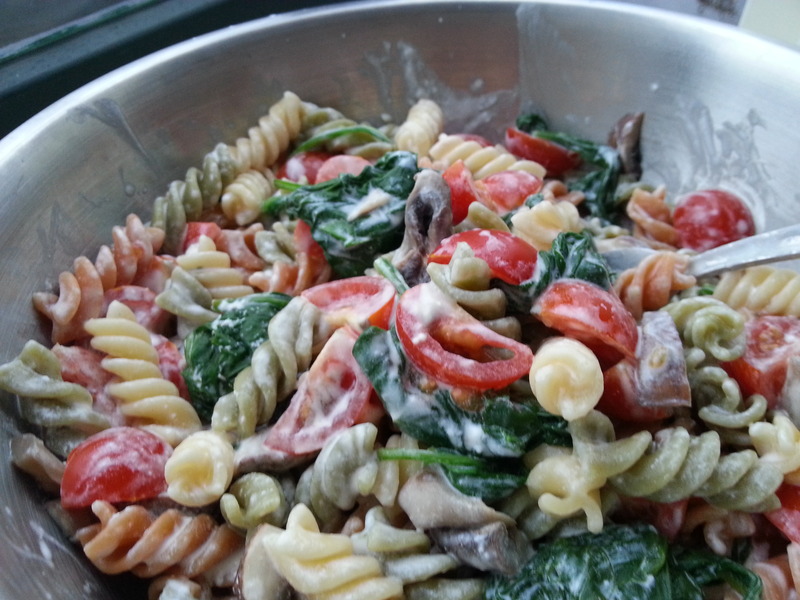 AS A STUDENT, I would often make rice for dinner, paired with deep-freeze spinach and something crazy on the side, like plain mixed lettuce. I know, I know… that doesn’t make any sense. TO MAKE MATTER WORSE, the rice would usually turn to mush (be overcooked), sometimes be too chewy (undercooked) and almost never turned out just right. AFTER YEARS OF OCCASSIONAL EXPERIMENTING, and thanks to the influence of good cooks around my friends and family, plus a lot of trial & error, I’ve got a grip on making good rice. IF YOU ALSO STRUGGLE with making rice because it hardly turns out right – or if you love rice, and want to make it even better, read on for tips on buying, cooking and eating rice. PREPARING GOOD RICE = discovering a whole new world. A world that is especially handy to know considering my recent love affair with Indian and Thai cuisine, where rice is a staple (breakfast, dinner, snack, dessert anyone?) 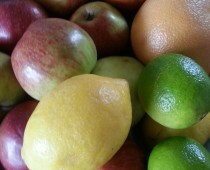 and a friendly companion to almost any dish. HOW DO THESE PEOPLE SURVIVE on eating so much rice? It’s because they know how to make it. Real. Good. 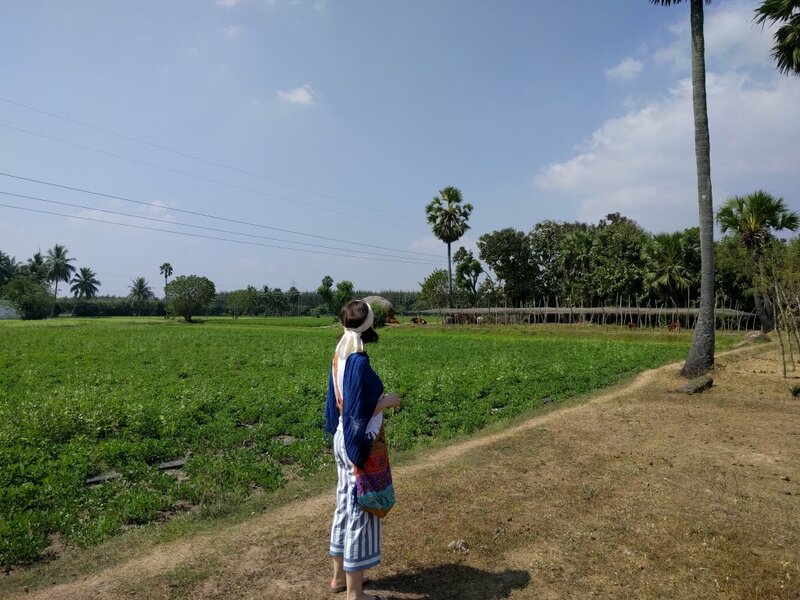 Me on an organic farm in Tamil Nadu region, India. Making good rice starts with buying good rice. In Dutch supermarkets, you can mostly find rice packaged per 400 grams or maybe a kilo if you’re lucky, and it’s mostly white parboiled (Dutch: snelkook) rice or silver grain rice. Asian supermarkets as well as supermarkets with a wide variety or bulk packaging will often have rice packer per 5 or 10 kilograms, so those are good places to buy. They also have a wider variety of rice than regular (Western) supermarkets, worth trying out or experimenting with. 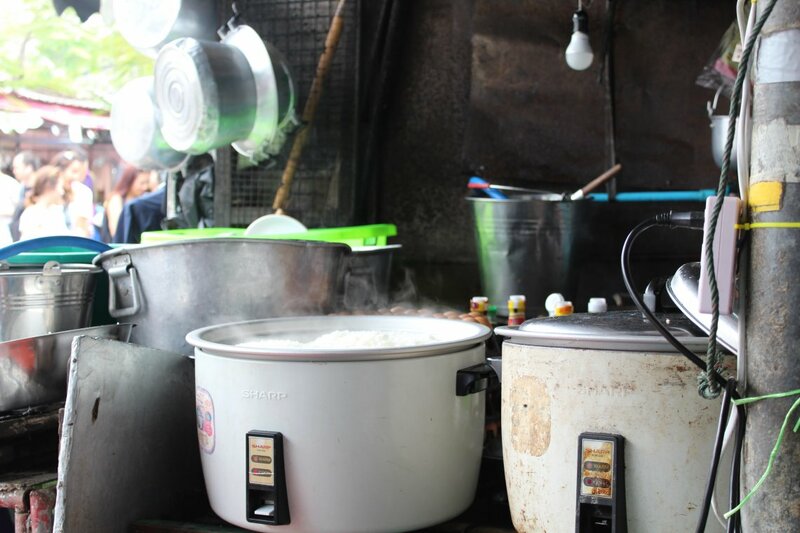 White (parboiled) rice has the sweetest taste. It is processed (bran and germ layer removed) to look nicer and cook faster. Brown rice (=wholegrain rice) is unprocessed white rice, so only the outer husk has been removed. It still has the rice bran and germ layer around the grain, tastes a bit less sweet due to containing more fibres, has a better glycemic index and is more nutritious since most B vitamins found in rice are located in the layers removed in white rice. 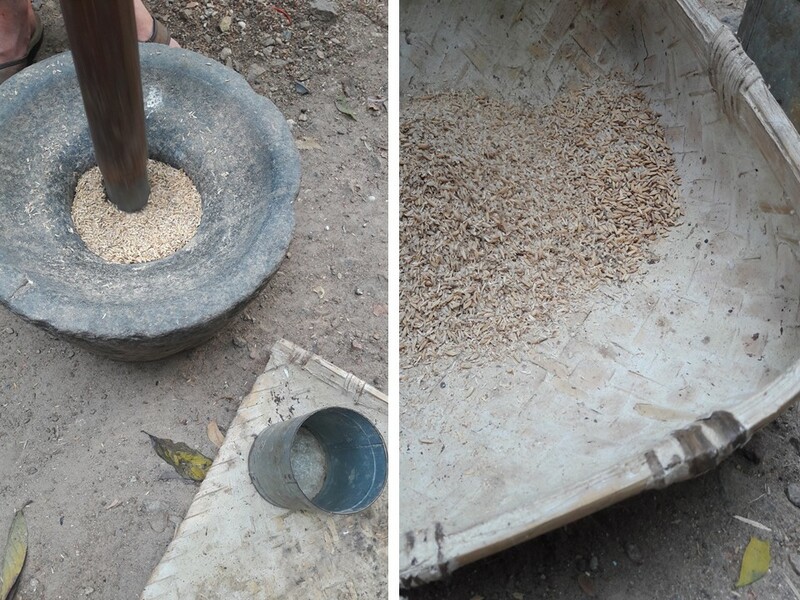 Discovering rice in India – left: using a larger pestle and mortar to break rice husk open, right: rice grains and rice husk can now be separated, to give brown rice (bran and germ layer still intact). Black rice is also more nutritious than white rice and also has a longer cooking time. It’s a different sort of rice with a distinctive flavor and slightly different texture than brown rice. It’s hard to describe – maybe best to try it sometime. 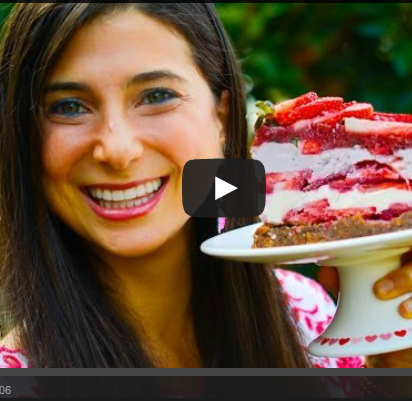 I like it a lot, especially in sweet dishes or as breakfast, since it’s not too sweet on its own (like white rice), it pairs well with sweet flavors. Red rice works well in savory dishes, looks beautiful (especially in combination with wholegrain rice), has a bit more of an earthier flavor and is full of nutrients. 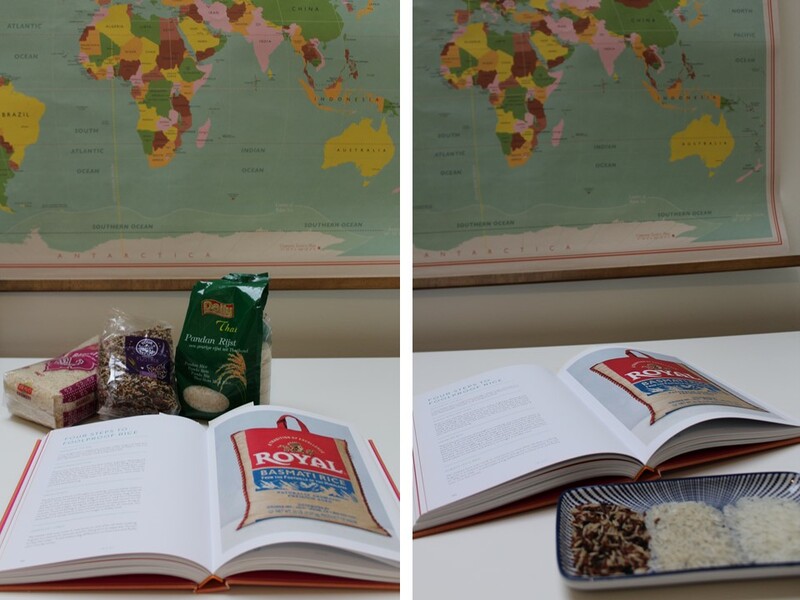 I love the book Fresh India by Meera Sodha, and have been using her tips on cooking rice. She swears by rinsing the rice first, even if the instructions of the package say it’s not neccesary. Rinsing rice helps remove starches, making the rice less sticky and more fluffy after cooking. Soaking the rice is also a concept that was completely new to me (why wait longer to make my rice if I can just cook it in 10 minutes?). However, I’ve discovered something completely magical. When leaving the rinsed rice to soak in water for about 10-20 minutes, you notice a significant change in the shape of the rice grains. It’s amazing. They become much more sci-fi looking. Soaking too helps with achieving that fluffy texture of cooked rice. Add cold or lukewarm water to the bowl with rinsed rice, leave on counter for 20 minutes, more or less. Some do this for an hour, but I haven’t been this patient yet. After this time, drain. Now you are left with rinsed, soaked rice. 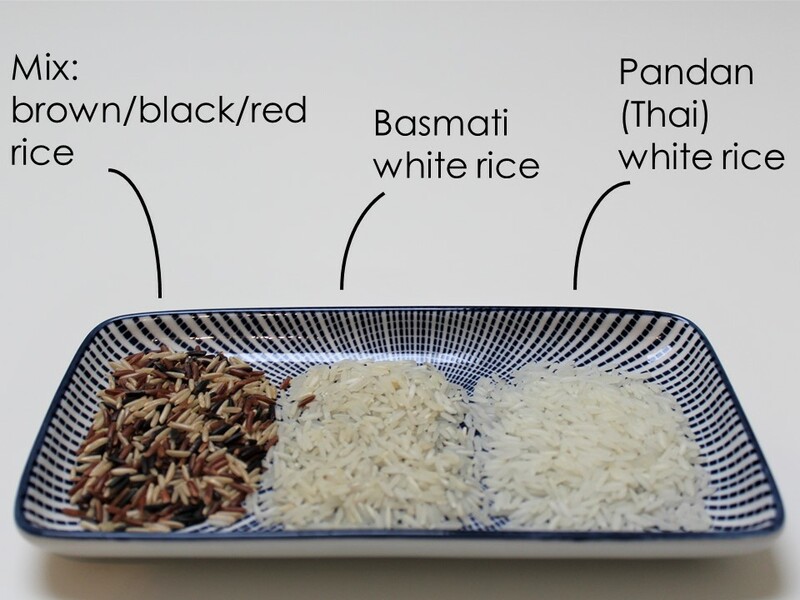 When cooking rice, most packages will carry their own instructions, but it comes down to parboiled rice being fastest to cook (since it has been pre-processed), and other types (brown, black, red) taking longer. But my main trick, no matter how long the cooking time, is to start with cold water (approx. 2 cups water to 1 cup rice), bringing this water to a boil and then decreasing the heat to a low simmer, so the rice on the bottom won’t get burned and start sticking to the pan, while the rice on top isn’t even cooked yet. Use part water, part rice, as instructed on package or ratio 2:1. Bring cold water with rice to a boil, reduce to a simmer for time mentioned on package, or 8-10 minutes (for white/pandan/basmati rice). When the rice is cooked (if you try a bite, it should be easy to chew but still have a bit of al dente to it), drain excess water and leave the rice in the cooking pan, off heat, lid on, for at least 10 minutes. This will steam the rice to perfection. Afterwards, run a fork through the rice to separate the grains into magical fluffyness of goodness. See ahead for inspiration and feel free to explore the Internetz for the perfect recipe for your own use! Good morning! 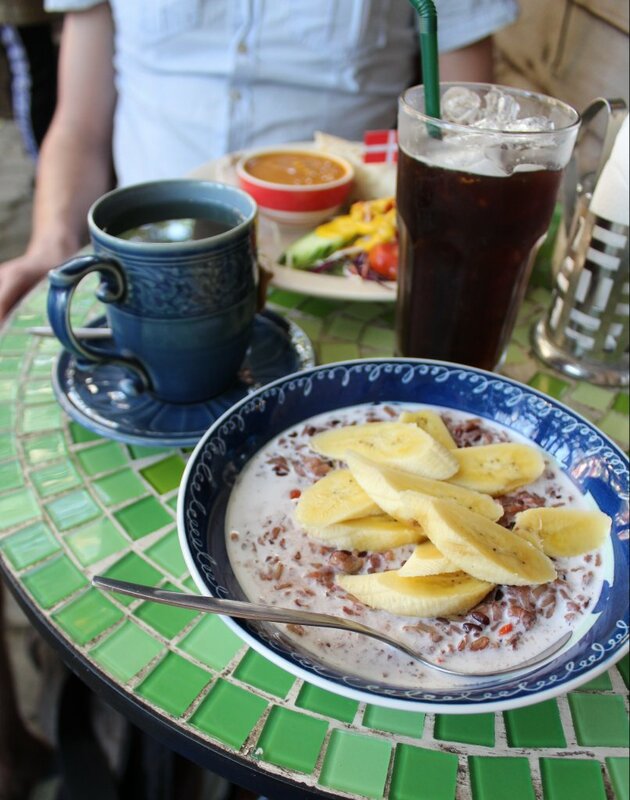 Breakfast at the Cat Shack in Chiang Mai, Thailand: brown rice porridge in coconut milk, with goji berries fresh bananas. 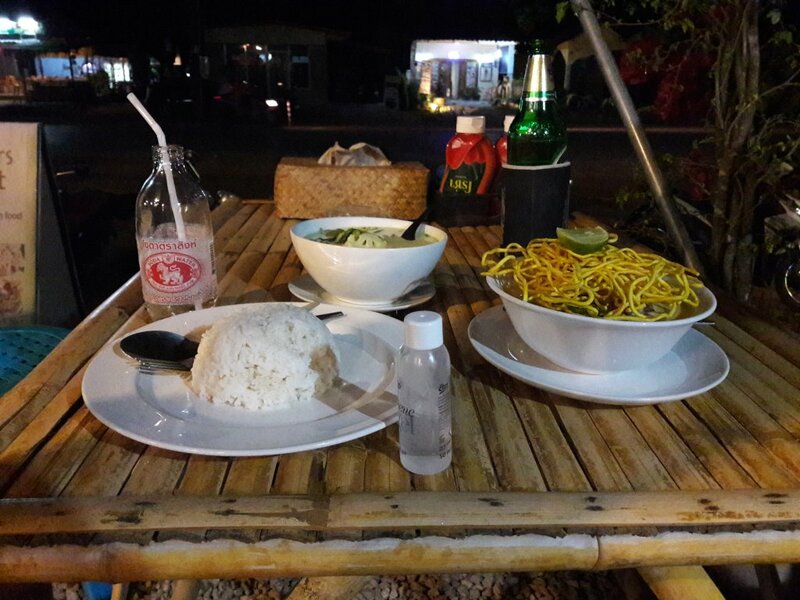 Green curry served with white rice, on side of the road on Koh Lanta island, Thailand. 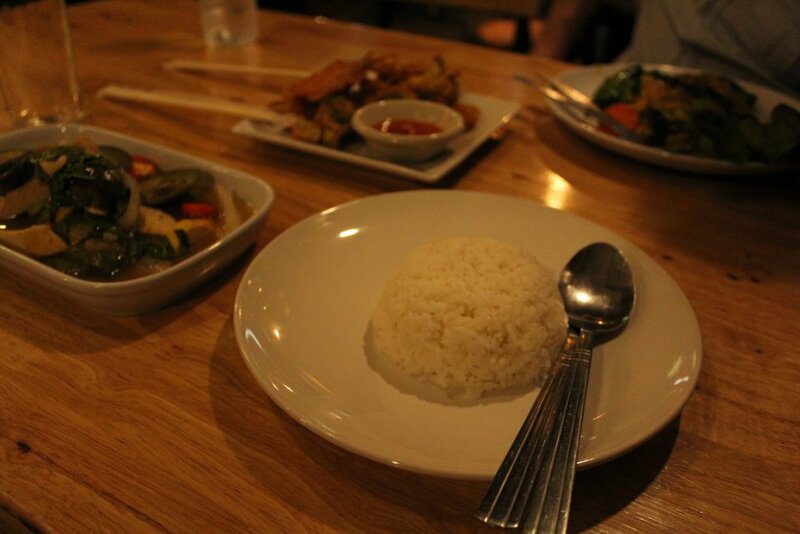 Another dinner in Chiang Mai, Thailand: eggplant & green bell pepper stew served with white rice. 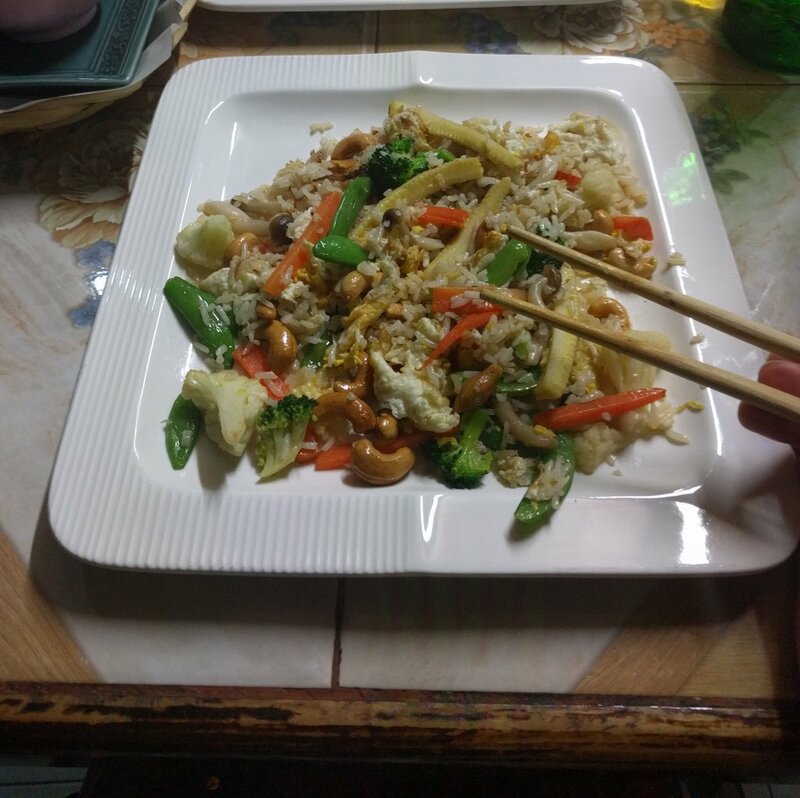 Stir fried rice with healthy, delicious vegetables, egg and cashews, Thailand. Eat whole grain or mixture of wholegrain/black/red rice, instead of white rice, as a natural way to increase your fibre intake (very bowel-healthy). White rice has the highest glycemic index of all types, if you’re working on stabilising your blood sugar, think about minimazing intake of white rice and replace it with smaller portions of deliciously steamed brown rice or a mixture of wholegrain/black/red rice.